Biotinylated Human B7-H6, His Tag, Avi Tag (B76-H82E5) is expressed from human 293 cells (HEK293). It contains AA Asp 25 - Ser 262 (Accession # Q68D85-1). The protein has a calculated MW of 30.4 kDa. The protein migrates as 40-60 kDa under reducing (R) condition (SDS-PAGE) due to glycosylation. 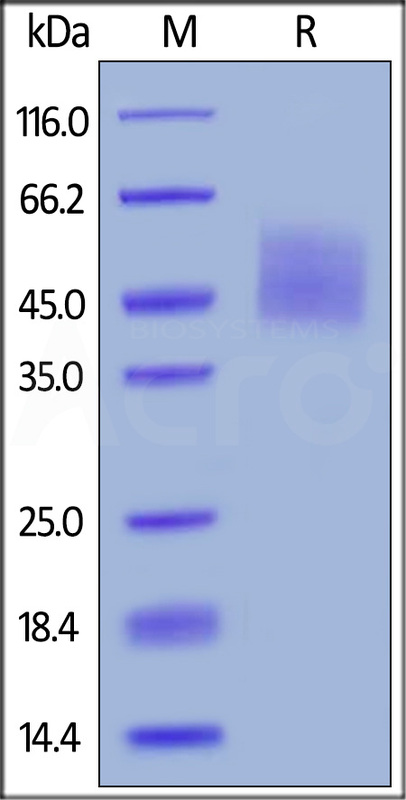 Biotinylated Human B7-H6, His Tag, Avi Tag on SDS-PAGE under reducing (R) condition. The gel was stained overnight with Coomassie Blue. The purity of the protein is greater than 90%. Immobilized Human NKp30, Fc Tag (Cat. No. 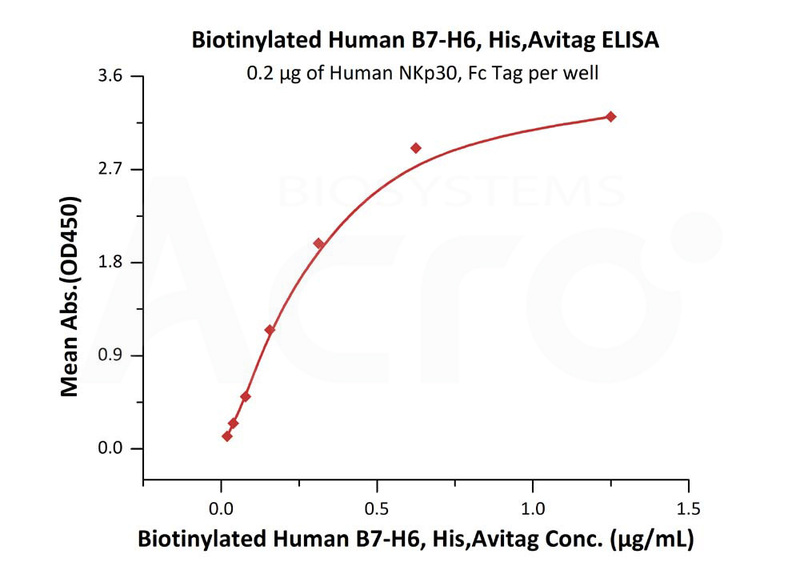 NC3-H5259) at 2 μg/mL (100 μL/well) can bind Biotinylated Human B7-H6, His Tag, Avi Tag (Cat. No. B76-H82E5) with a linear range of 0.02-0.313 μg/mL (QC tested). The B7 family of genes is essential in the regulation of the adaptive immune system. one of which is the recently discovered B7H6. Humans and rats have a single B7H6 gene; however, many B7H6 genes were detected in a single large cluster in the Xenopus genome. Chimeric antigen receptor (CAR) T-cell therapies have demonstrated durable and potentially curative therapeutic efficacy against B-cell leukemia in clinical trials. In this study, B7H6, a ligand for the NK cell activating receptor NKp30, was targeted to create a CAR that targets multiple tumor types. B7H6 is expressed on various primary human tumors, including leukemia, lymphoma and gastrointestinal stromal tumors, but it is not constitutively expressed on normal tissues. (1) Wu MR, et all., 2015, Gene Ther.22(8):675-84. (2) Phillips M, et all., 2016, Biopolymers. 106(5):658-72. (3) Flajnik MF, et all., 2012 Immunogenetics. 64(8):571-90.